KATHMANDU, July 5: The national team selection committee comprising of International Cricket Council representative Venkatapathi Raju, national team head coach Jagat Tamata and skipper Paras Khadka on Monday announced a 15-member squad for England tour slated for July 11 to 22. The ICC formed the committee after the world cricket governing body suspended Cricket Association of Nepal (CAN) in April. Nepal is travelling to the European nation to play against Marylebone Cricket Club (MCC) at the Lord's Cricket Ground on July 19 to mark the 200th years of bilateral relation between Nepal and the United Kingdom. Paras is the captain of the team while Gyanendra Malla is the vice-captain. Shakti Prasad Gauchan, Basant Regmi, Sharad Vesawkar, Sompal Kami, Sagar Pun, Binod Bhandari, Subash Khakurel, Karan KC, Anil Kumar Mandal, Sandeep Lamichhane, Bikram Sob, Raju Rijal and Rajesh Pulami Magar are other members of the team. 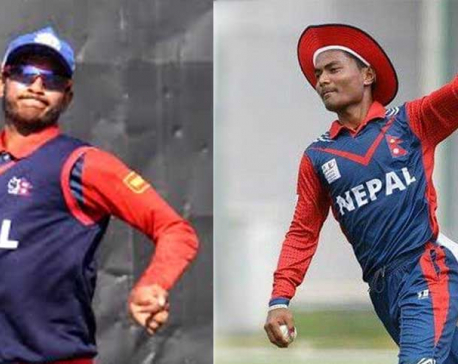 Naresh Budhayair and Susan Bhari, who were in the national team during Nepal's ICC World Cricket League Championship match against Namibia on April 16 and 18, have been dropped from the team while Subash, Karan and Anil have been included this time after missing out on the last occasion. Before taking on MCC, Nepal will play two 20-over matches on July 13 and 14 and two 50-over matches on July 15 and 17 against the local clubs in England. The tour is part of preparation for Nepal's fourth round matches of the ICC World Cricket League Championship. Nepal is scheduled to take on the Netherlands on August 13 and 15 in the List A (50-over) matches. Team coach Jagat Tamata said that the tour was a part of preparation for the championship. “We have taken the tour as an opportunity to prepare for the Netherlands matches as well,” said Tamata. He also informed that after returning from the UK on July 22, Nepal will begin its training from June 24 and leave for the Netherlands on August 4.